I found these in my Grandmother's things and I'm wondering if you might know what they are? I've attached a photo. One is a simple circle with a cross and the other is a gold star with an M.
Simon Says: I enlarged your photo a little bit, Teresa so it is a little easier to see the details. As intricate as the larger piece is, I'm sure it has a story to tell. The hexagram (or 6 pointed star) is known as The Star of David. In Hebrew, it is known as the Shield of David or Magen David, which in modern Hebrew is pronounced as maˈɡen daˈvid or as Mogein Dovid ˈmɔɡeɪn ˈdɔvid. The Shield of David is a generally recognized symbol of Jewish identity and Judaism, much as the cross is generally recognized as a symbol of Christianity. Does anyone else have pieces of jewelry like this, or can you tell Teresa anything about these? 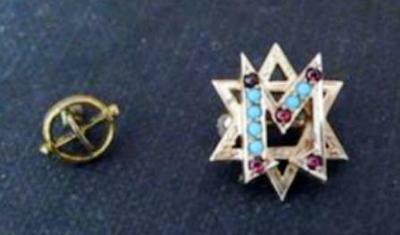 Magen David With An "M"...Obvious or Symbolic? Don't overlook the possibly obvious. If your grandmother's name or an ancestor of her started with an "M" that could explain it, especially if it's a custom made piece. It could have deeper symbolic meaning. The letter "M" in Greek, which is also the number 12. 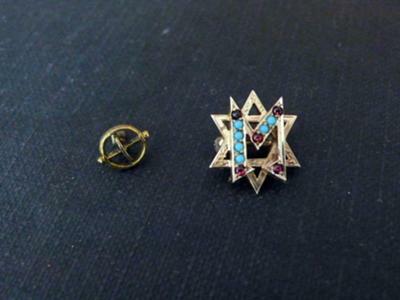 The hexagram "Star of David" became the Jewish symbol. Perhaps it represents the 12 tribes if Israel. Anthropologists claim that the triangle pointing downward represents female sexuality, and the triangle pointing upward, male sexuality; thus, their combination symbolizes unity and harmony. In alchemy, the two triangles symbolize *"fire" and *"water"; together, they represent the reconciliation of opposites. The earliest known Jewish use of the hexagram was as a seal in ancient Israel (6th century B.C.E.) and then eight centuries later [c. 200 AC] in a *synagogue frieze in Capernaum. But these early hexagrams may have been only ornamental designs. ? In the Middle Ages, hexagrams appear frequently on churches, but rarely in synagogues or on Jewish ritual objects. It was the menorah that served as the primary Jewish symbol from antiquity until the post-Renaissance period, not the "Jewish star." Although scholars have attempted to trace the Star of David back to King David himself, no Jewish literature or artifacts document this claim. Rather, all evidence suggests that the early use of the hexagram was limited to "practical" Cabbala. In another alleged alchemy symbolism, the angel pointed down represents God?s reaching down to man and the upward point symbolizes man reaching out to God. Ultimately, symbols are highly interpretive to the individual person. It might mean one thing to me, but a another thing to you. Also, symbols can have literal or mystic meaning. They can simply be figures of speech. Whatever its purpose is, it's lovely. Simon Says: All true, Faithful Witness. You're definitely up on your knowledge of history! For those who are unfamiliar with the word, "Cabbala", which Faithful Witness mentioned, which is also spelled as Kabballah, Kabala, Qabala, or Qabbalah, it is an esoteric (mystical) theosophy of rabbinical origin based on the Hebrew scriptures that was developed between the 7th and 18th centuries.